Powerful radio signals that Jupiter generates could be used to help researchers scan its giant moons for oceans that could be home to extraterrestrial life, according to a recent study submitted to the journal Icarus. Jupiter, the largest planet in the solar system, possesses 67 known moons, including three giant icy moons that might possess liquid oceans underneath their frozen surfaces. 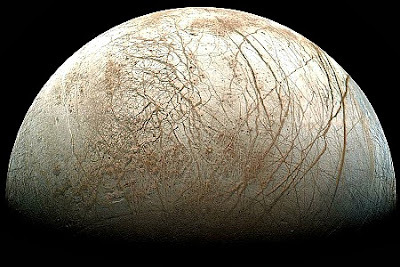 Astrobiologists want to investigate Europa, Ganymede and Callisto for extraterrestrial life, as there is life virtually wherever there is liquid water on Earth. Of Jupiter's three largest icy moons, Europa, which is roughly the size of Earth's moon, is favored as having the greatest potential to sustain life. Magnetic readings captured by NASA's Galileo spacecraft provided compelling hints that it has an ocean, and radio scans by the probe suggest a water-rich layer beneath the surface between 50 to 105 miles (80 to 170 kilometers) thick. Recent findings even suggest its ocean could be loaded with enough oxygen to support millions of tons worth of marine life. . . .